Cloudy. All the time. We're not talking Maui sky either. Underwater, Perpetual Haze... followed by Milky Haze... followed by Silt and Haze... and that's when we're lucky. Why? Sand. Sand, and more sand. We've heard complaints that the famous Ka'anapali Beach is disappearing. Well, we know where it's going. It's right out here. It's in the water, and it's all over the ocean bottom. There are places along the shoreline here that have beaches now for the first time in twenty years. Sand on the bottom means less seaweed growth. Sand on the reefs means dead coral. Sand in the water cuts off the sunlight, which also reduces seaweed and coral growth. Why is this happening? We don't know. What we do know is that this is an accelerating trend, one that started a couple of years ago. As if the sand in the water weren't enough, there are days when poor underwater visibility is compounded by cloudy skies and, in the latter part of this week, one outrageous Lahaina Express current. In truth, it's difficult to summon the enthusiasm to dive. We know now we snorkel all the way "out there" only to find a few scattered turtles. These few scattered turtles are the same ones we've seen on all other dives. Worse, some of our loved main players haven't shown up yet. Prominent on the list of missing is Wana. We can't remember a year when so many turtles leave (and often quickly) when we show up. They are so distant when we see them depart, we can't even tell whether it's someone we know or simply an ultra-shy stranger. It feels like the honu are spooked, perhaps by the poor visibility. 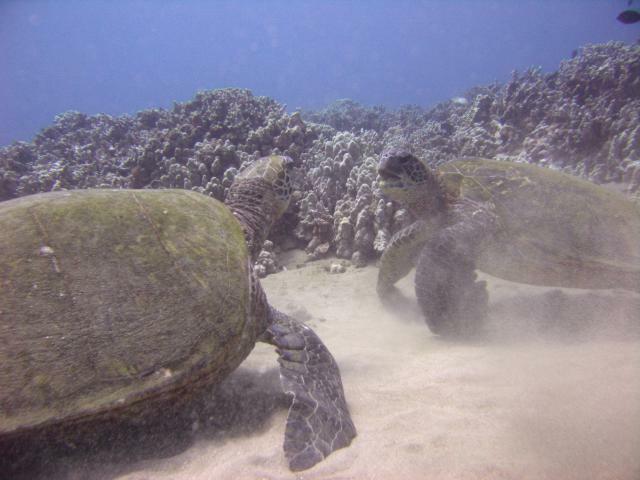 In that respect, Summer 2005 is feeling a lot like Summer 1994, another year with silty water and few honu. A swell this week has kept us from snorkelling at the foraging site as well. So what can we say about this week? Even in a housing, it's so tiny that it's almost like diving without a camera. Best of all, it takes wonderful pictures. Here's one of the very first. The most exciting thing that happened underwater involved Amuala crabbing with a fellow over some real estate. 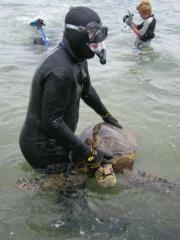 This week, we received an invitation from George Balazs to accompany him and his colleagues on a turtle survey. We jumped at the chance. Once anchored, it first appeared that there few turtles to process. 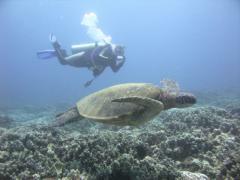 George and several assistants went over the side and began what we thought would be a meager honu roundup. We watched the operation from the comfort (and dryness) of the fishing boat with Ed as Operations Supervisor and Coordinator. It actually turned out to be a decent haul. George and his team finally hauled (one-by-reluctant-one) a dozen honu up into the boat. 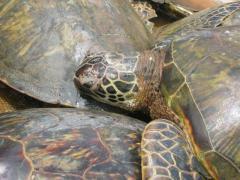 Some turtles were less cooperative than others. 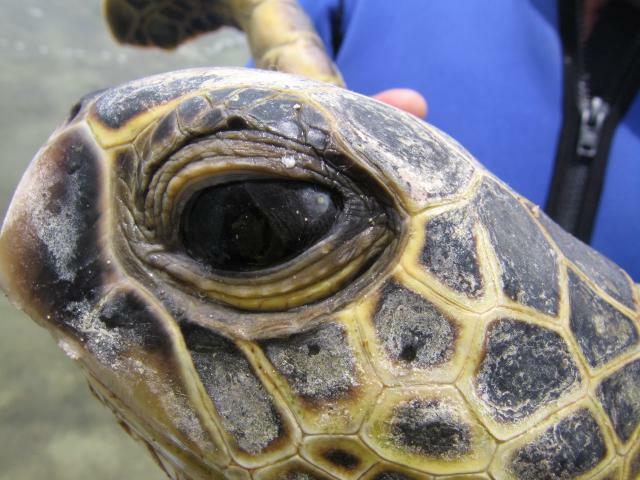 Our own quick scan of the turtles suggested a fairly healthy population but there was some evidence of fibropapilloma--all limited to the eyes. We refer to that as having nothing more than a "sniffle." 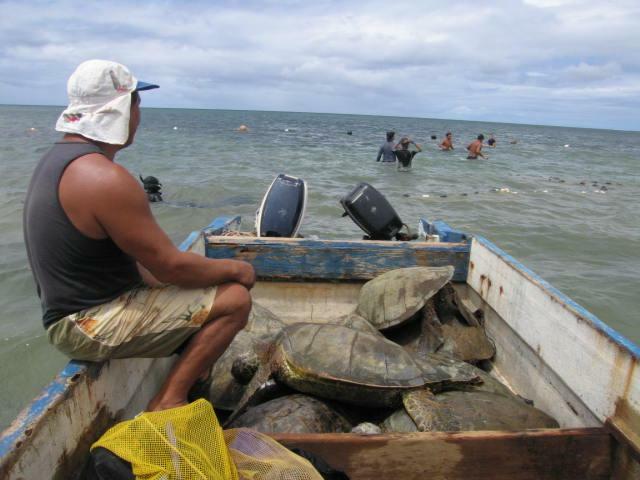 Turtles were measured and checked for tags that would reveal them as recaptures from other round-ups, usually meaning in other years. One recapture turned out to be an FP regression case. All good news on the FP Front. After measuring, turtles were photographed and released. For us, it was very important to our own understanding of fibropapilloma to see this one-day Molokai sample. We expected to see more tumored turtles than we did. Fact is, not one had more than the two tiniest #1 tumors in the eyes. It would take very close inspection, including knowing what to look for, to rate a turtle as even slightly "sick." This would, however, also correspond to what we see at our dive site. 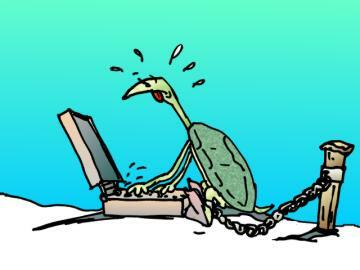 For the 41 green turtles currently logged in for 2005, 34 (83%) were sighted in a previous year (resights). Of the 34 resights, 19 (55%) have had tumors. Of those 19, 17 are confirmed regression cases. Of those 17, 16 (94%) have no obvious tumors. That is, anyone dropped into our dive site would look around and see a population much like the Molokai group. Healthy. That is, apparently healthy. Something odd happening to an eye or two--a very low FP site all things considered. They'd never guess 55% of the resighted turtles were sick at one time. When the new cases are added, FP rates go well past 60%. Still, a very low level compared to the heights of the early 90s. 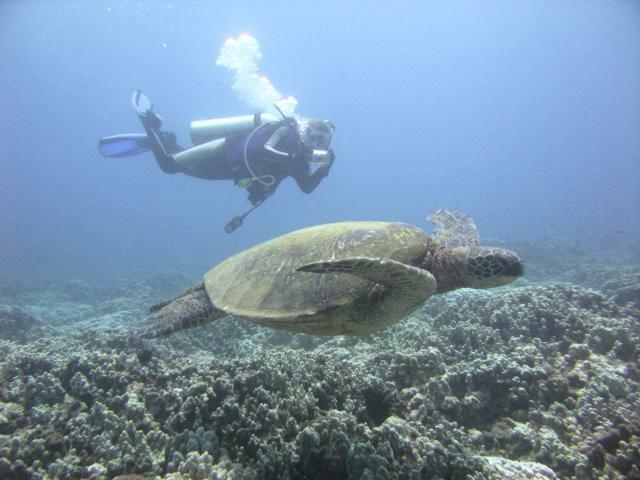 All very good news for the honu on both islands. 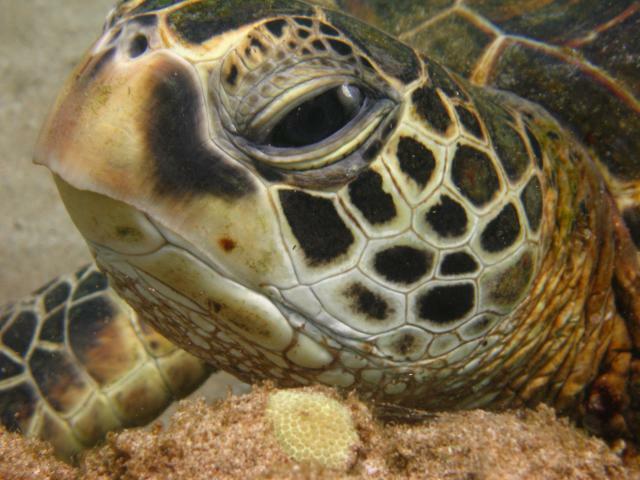 This image shows the eye of the little honu who lives in The Cavern. From our underwater experiences, we know that this Honokowai youngster is in trouble. She sports a hotspot in the posterior of her left eye. It's entirely possible that by summer's end this hotspot could be a fully erupted #1 ocular tumor. This Molokai youngster's eye is telegraphing the same problem: FP incoming. Unfortunately, chances of this being confirmed are slim. George tells us that his recapture rate at this site is around 10-12%, so we'd be extremely lucky if George managed to capture her again next year. If he did, however, we think she'd have at least a #1 tumor in her eye. When we began this summer, we thought it would be the first summer since 1988 in which we had no pressure and no goals except to enjoy ourselves. Well, that lasted exactly a week. 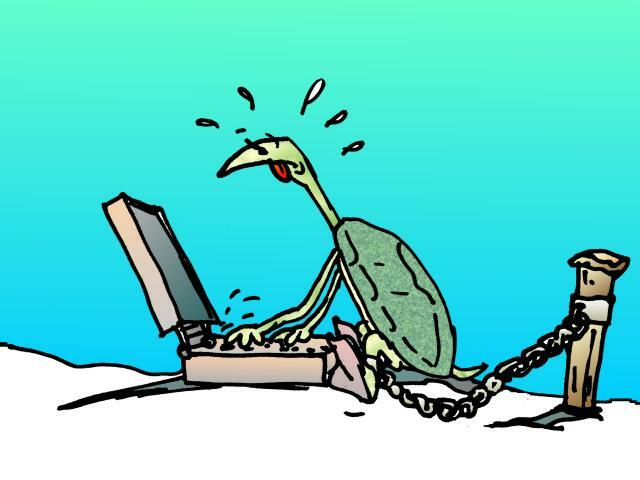 On July 14, we got word that our idea for a honu book had appealed to a publisher. That meant we had to finish the durn manuscript. Well, re-finish. We'd completed it once but then, we'd ripped it apart and started over. We'd submitted the first half to see if the idea would fly--and she flew, Jim. The heat? Is on! So it's up early every morning to write. Writing is Job One. It even supersedes our early morning kayaking. If it becomes necessary, it will outrank diving. Fortunately, it hasn't reached that point yet. We're not saying why.